Climate change increases severe weather, be it extreme heat, drought, floods, storms, tornadoes or hurricanes. This endangers everyone, but low-income individuals are particularly vulnerable. Consider Hurricane Katrina. Low-income residents of Louisiana lacked the resources and mobility to get out of the path of danger, often lacked insurance to recoup losses, and didn’t have the savings required to rebuild their lives. As climate change continues, people who rely on agriculture for their food and income are at risk. Mother Jones illustrated the drastic effects using data from the National Climate Assessment. 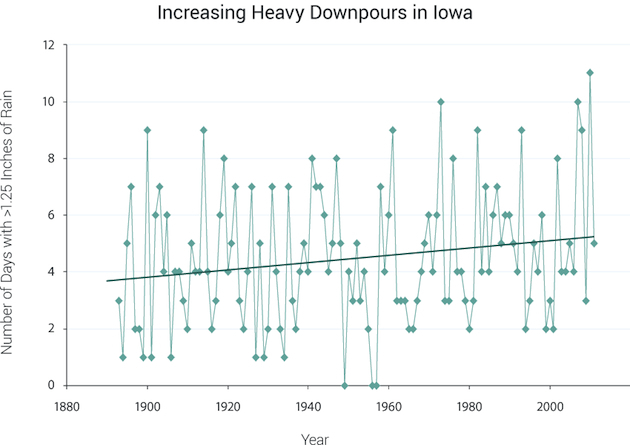 The article states, “In spring 2013, Iowa experienced its wettest spring ever, with storms that washed away titanic amounts of topsoil. The previous summer, it underwent its most severe drought in generations. Such gyrations can be expected to continue.” Although the charts focus on American crops, this is a global issue. Nations and communities that produce their own food locally are vulnerable to widespread famine. Fossil fuels harm the environment and the people who rely on it for a living. For instance, about 40% of all seafood in American once originated from the Gulf Coast, and the Gulf oil spill devastated the fishing industry. Three years later, people who rely on fish, crabs, oysters, and other sea animals for their livelihood have yet to recover. Coastal communities play the role of the proverbial canary in the coal mine. As polar ice caps melt, sea levels rise, and communities on coasts are the first to suffer the consequences. Tourism industries– which often benefit low-income individuals in the service industry– will continue to struggle with the effects of climate change. Rural electrification. Rural communities often pay the price for climate change without even getting the chance to benefit from modern energy production. Millions of people across the globe lack access to electricity. This limits productivity and has safety and health consequences. By installing renewable energy, rural village residents improve their lives without compromising their local environment. Through the use of micro-grids, communities can address their unique energy needs. Community-owned solar power contributes to energy democracy. Not everyone can install solar power on their homes, so shared solar allows a diverse group of people to support renewable energy. This entry was posted in Climate change and tagged climate gap, climate justice, social equity, social justice, Solar Power. Bookmark the permalink.